Taking up an unconventional job of a late night Radio Jockey for a middle class naïve woman whose talents vary only from cooking, mimicking to taking part in some silly games is no easy task. 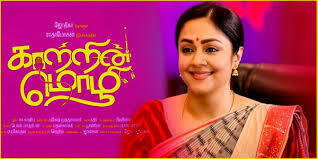 The popular Hindi hit ‘Tumhari Sulu’, the Tamizh adaptation brings out the vivacious, still pretty and talented Jyothika once again on the silver screen through ‘Katrin Mozhi’. Director Radha Mohan who showcased Jyothika’s acting prowess earlier through ‘Mozhi’ had done it again. A garrulous, happy go lucky housewife Vijayalakshmi Balakrishnan is happy to be a housewife with a loving husband and a school going son. But, suddenly a price she wins in one interactive programs of the FM Radio makes her think of taking up a job as a RJ with no experience. In a way her ever chiding father and her inability to clear plus two exams while her elder sisters are bank employees is responsible for her to go for ‘some’ employment. Here luck in her nonstop chatting strength gets her the job; but as a RJ she has to be a problem solver for late night callers. One can understand that is going to be more of dirty talking with a husky voice to the lecherous men especially. Luckily, in the Tamizh version, Viji puts some sense in the minds of a couple of really mentally troubled souls and no titillating talk. But, Viji’s odd hour job, the pressure in her husband’s work place and the teenage son’s peers’ jibes turn into the boy being suspended from school for misconduct. When the boy disappears, hell breaks out; the already critical siblings, father and husband take Viji and her job to task. In the mean while, her talk show becomes a hit among the public and the Radio reaps the benefits and popularity. How Viji’s problems get resolved form the climax. Undoubtedly this is a feel good movie with little more comic add-ons through a few characters in the gated community. The movie passes on the message of women’s lib also in a way that there is nothing to feel ashamed about taking up odd jobs at working hours. Though Vidya Balan in the original with her portly and dowdy disposition looked fit the role like a glove, Jyothika with her charming looks and a little bit of over exuberance steals the show in the company of Vidharth and a few others new but known faces. The songs luckily do not hamper the proceedings. Good to see a Tamizh movie with no politics, no obscenity and no morbid violence.